There is something so appealing about a beaded bead: It can sparkle with simple elegance or it can demand attention the moment you enter a room. The beaded bead can change your entire look with one color or with a multihued pattern. It's one of the easiest ways to add a little extra charm to a piece of jewelry, and it's nearly impossible to overdo. From the first time I stitched one of these beadwoven wonders, I was hooked. For my Challenge piece in the upcoming December/January issue of Beadwork, I knew I had to incorporate a simple beaded bead into the necklace I made to balance out the larger, flashier pendant I'd stitched. I chose Melinda Barta's Seeing Stars design, Bead One of the Beaded Bead Contest, from the February/March 2012 issue of Beadwork. 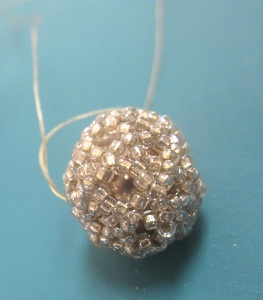 I used soft gold-lined clear seed beads around a light brown crystal pearl. I plan to create another one of this version of the beaded bead to use as a focal on a simple gold chain–which I'll pair with a little black dress for holiday parties this year. How are you using beaded beads in your designs? How do you make these small components stand out in your pieces? We want YOU to help us celebrate our 15th anniversary by entering Beadwork's Beaded Bead Contest. Each of the five 2012 issues of Beadwork magazine includes a beaded bead project (February/March, April/May, June/July, August/September, and October/November). Share a piece of jewelry you made that incorporates at least one of each of the five anniversary beaded beads. The winning jewelry project, which will be chosen by BeadingDaily.com members, will be showcased in the February/March 2013 issue of Beadwork magazine. CLICK HERE for more information about the 15th Anniversary Beaded Bead Contest. Submit your entries between October 22 and October 26, 2012. The time window for submissions is fast-approaching, so be ready to upload your photos! Showcase your creativity with beaded beads! See more photos of our beaded beads HERE. What's Your Necklace Making Style?